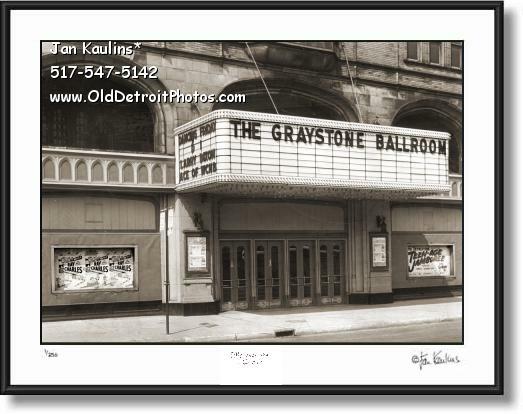 GRAYSTONE BALLROOM DETROIT photo picture print photograph for sale. This sepia toned DETROIT GRAYSTONE BALLROOM photo print for sale is made from a professionally restored original black and white historical vintage GRAYSTONE BALLROOM photo print from the late 1950's or very early 1960's. On the end of the marquee it shows "Larry Dixon Ace of WCNB" appearing and in the advertising for coming up appearances in the left window are three posters advertising the upcoming RAY CHARLES appearance at The Graystone Ballroom. On the other advertising window is a plug for the upcoming "Teen-Age Jamboree." This is a quite rare and wonderful image of this historic DETROIT GRAYSTONE BALLROOM photo print for sale. For those who remember, or were lucky enough to be around during the heyday of the vibrant, African American community known as Paradise Valley, they know how important the Graystone was to Detroit. It was one the area’s main attractions. The Graystone Ballroom was a famous Detroit entertainment venue located on Woodward Avenue and was founded by jazz bandleader Jean Goldkette. In the 1920s, ’30s and ’40s prominent bands like the Duke Ellington and Jimmie Lunceford orchestras “battled” Detroit bands such as McKinney’s Cotton Pickers and Goldkette’s own group to the delight of dancers and listeners who packed the ballroom on a nightly basis.